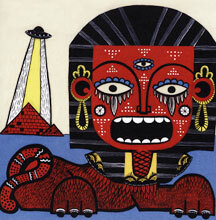 Lui Delai Gau, above, is the work of Stella Im Hultberg, and a Sphinx is by Foi Jimenez. 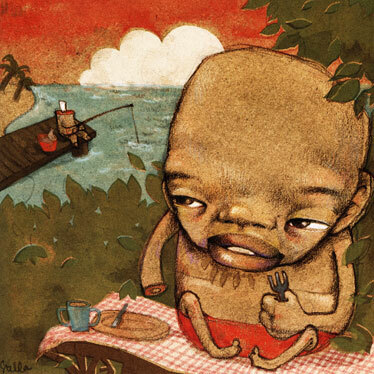 Hultberg and Jimenez are among the illustrators featured in "Beasts." It's the job of editors to hew order out of chaos, and when you're combining fiercely independent artists with the vagaries of cryptozoology, you're just asking for entropy squared. Accordingly, it was a long time before Fantagraphics' rumored "Beasts!" was released, but editor Jacob Covey has done a marvelous job of putting it together. It must have been like herding rabid mice. As the book's forward points out, "cryptozoology is the 'study of hidden animals.' It is a disputed branch of science populated by elusive creatures both presumed to exist, such as the Colossal Octopus, and those largely held not to exist, such as the Sasquatch or Leviathan. These creatures are referred to as cryptids." Indeed. What we have here is one editor flogging four writers and 90 artists into creating a handsome picture book that describes, in both word and image, nearly a hundred fabled animals. Although the writing is punchy, it's the art that carries you through. Some are creatures of the fevered imagination; others are droll fairy tales; some are possibly real but undiscovered. They remind us that there are things moving around out there in the darkness, beyond the range of the campfire, and all we catch is the red gleam of their eyes. If there's a dark, urban tone to the book, maybe that's because editor Covey operates in rainy Seattle, under the grumbling menace of Mount Rainier and just a few miles away from Bigfoot country. Or maybe "X-Files" territory. Most of the drawings are a bit unsettling and perversely detailed. "Where the Wild Things Are"? They're in your head. The diverse bunch of illustrators include Craig Thompson, Souther Salazar, Jeff Soto, Glenn Barr, Dave Cooper, Tim Biskup, Seonna Hong, Jeremy Fish and Jay Ryan, Anders Nilsen, Art Chantry, Brian Chippendale, Brian Ralph, Bwana Spoons, Colleen Coover, Jason Miles, Jesse LeDoux, Johnny Ryan, Jordan Crane, Keith Shore, Kevin Scalzo, Marc Bell, Martin Cendreda, Mat Brinkman, R. Kikuo Johnson, Richard Sala, Sammy Harkham, S. Britt, Steven Weissman, Ted Jouflas, Tom Gauld and Hawaii's own Stan Sakai, who contributes a creepy Japanese gaki, a kind of vampire. That's only some of the artists, who come from worlds as disparate as fine gallery art and skateboard design. All of these folks are obsessed by monsters, it seems, and while some of the depictions are monstrous, most are infused with empathy for the subject. Check out Renee French's pencil sketch of Bigfoot, for example. The hardcover book isn't the type to read at one sitting. You have to dip into this mythological menagerie at random, encountering these creatures by chance. At one time, everything here was thought to exist in real life, which either shows you how far we've come or how much we've lost. And it was only a couple of months ago that an entirely new species of leopard was discovered in Borneo. They're out there!